This debate does not seem to go away. Here is my view on this. Let me make one thing clear first. I’m not trying to change your mind with regards to what you believe when it comes to the question: Are Dogs Carnivores or Omnivores? 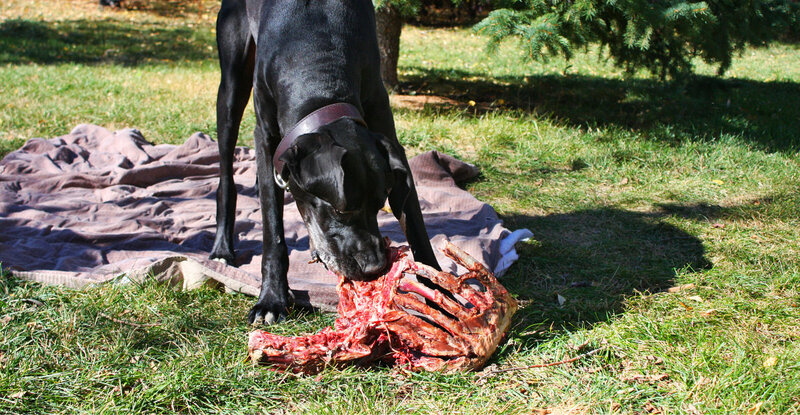 I am writing this article to explain better why I believe dogs are carnivores. Almost daily I get this: “Dog’s are Omnivores, not Carnivores” in response to what I state in some of my youtube videos and that’s all they say! No one offers further explanations as to why they think so and if I do decide to ask, the average reply I get is “google it” or “my vet says so.” Never have I gotten a well-thought-out answer with convincing evidence that dogs have evolved into omnivores. I actually would not mind listening to their reasons if they had any. My line of reasoning is not based on the fact that I want your beloved pet to be carnivorous, it is because all the evidence I see points to a carnivorous physiology that I cannot ignore. If you see what I see and agree that’s great, but if you do not, that’s perfectly fine too. I encourage all to do their own research like I did. I thank you for taking the time to read this article and as always your feedback is welcome. I think this is a very important debate, not so much for us but for our pet’s health since this is related to the food we give our pets, the ultimate foundation for good health. From their constant yapping years till they grow so big to display unalloyed strength and dedication to us. Dogs have and would perhaps remain the friendliest and most useful animal man has ever encountered. My most amusing observation about dogs is the fact that our little friends can consume anything and everything they see, from grains to meat and even our shoes (which in fact seems to be their favorite). Copyright © 2015 LnR Rig B. If you are one who cannot get enough of this great animal or if you’re big on the dog scene you’ll know that lately there has been a lot of controversy and arguments about what order of animals dogs fall into. While close to everyone knows that dogs are not herbivorous many people seem to think they are not carnivorous but rather omnivorous. With great vets like Dr Charles E Loops, arguing that they are carnivores and dog food companies and most vets insisting they are omnivorous let’s get definitions out of the way; so basically, omnivores are animals that eat various types of raw foods both plants and animal-based foods, carnivores eat only raw food (flesh) from animal sources. Some time ago, I got into a discussion with a group on facebook. The discussion was centered on the stomach structure and function of animals being the only way to place an animal in a certain class. By carefully studying different animals I have come to understand better. Being Carnivorous or Omnivorous can’t be decided by only one factor to the exclusion of others, there are many other factors that would place an animal in a particular class. As an animal naturopath, we look at the animal as a whole. Are dogs carnivores or omnivores? Is there a scientific answer to this? As this question is playing on your minds, I’m wondering if there is actually anyone better to answer the question than your dog! So in order to get a clearer and more practical understanding of this question, let’s take a look at the dog’s digestive structure and build. Generally, the dentition of animals points to the class they belong to, as their teeth dictate what they can tear apart and eat quite comfortably. With herbivores, their canines are either absent or very blunt, with big flat molars and premolars. It’s designed for eating plants and can’t be used to catch, hunt or tear apart tough flesh. The teeth of carnivores on the other hand are designed to tear apart prey and chew (shear) on tough flesh before the digestion process begins. 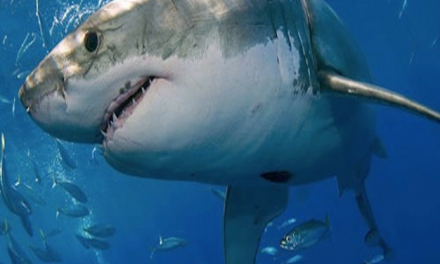 Carnivores have long, sharp canine teeth which are meant for catching and ripping prey apart. The carnassials (precise teeth located in the cheek) have the function of shearing while working in a scissor-like motion. These sets of teeth are unique to a carnivore. Another observation is the force of the bite. There’s a breed of dog with a bite force of about 700psi. Is that much? Yes, it sure is. The Kangal dog has a bite force that is close to that of a Kodiak bear. While you might say it’s not the animal with the strongest bite force, it however shows how much of a strong jaw a dog has. Dogs need this to crush bones not plant matters. But having said that omnivores like bears do need this force too since they are meat eaters too. But there is a crucial difference in the mechanism and motion of carnivores and omnivores. 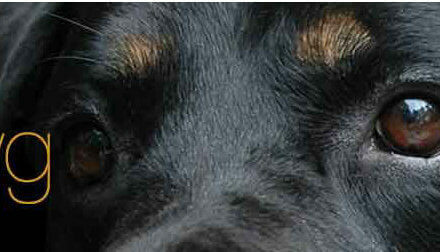 A dog’s jaw is hinged and unable to move sideways. Think of a scissor’s path of motion. Just straight up and own. The action is designed for shearing, cutting and crushing not grinding. 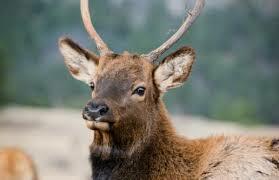 Omnivores can move their jaw sideways, just try it you’re an omnivore. They need this to properly mix enzymes into the food for digestion while grinding. This restricted motion of the jaw proves that dogs are not designed for chewing their food, just shearing and crushing bones. This is a big blow to the omnivore argument since chewing the food is a crucial for the process of digesting cellulose. Side note: I remember my grandmother (an omnivore) telling me to chew food 32 times before swallowing. I loved my grandmother and I always listened to everything she said so I became obsessed with this action for quite some time. Not so long after, I started to wonder how she came up with chewing 32 times and not 30. I could not get an answer to this. She said she got it from her mom. The point is that omnivores are designed to chew and grind so they can mix the food with digestive enzymes to start the digestive process. Carnivores do not have these enzymes and this is an important fact that cannot be disputed or ignored. Eating in the world of carnivores is a competition. In a pack, the one that eats the fastest gets the biggest meal. Therefore dogs are gulpers by their special design for survival. It’s all about speed! The physiology and the mechanism of eating fast are still present in our dog’s genome. I think my dogs would win any of those hot dog eating contests. To further facilitate this the saliva works as a lubricant to help the chunks of meat slide down the esophagus quickly. FYI, The saliva also contains bacteria-killing enzymes. The only reason a carnivore will perform any ‘chewing’ action is to cut larger pieces of meat or bone into smaller pieces so they can swallow them. It is important to see the distinction here. Since plant materials digest differently and take longer than meat and need certain enzymes to initiate this process it starts in the mouth of omnivores with the action of chewing and mixing in the enzymes needed. Carnivores cannot do any of this! That is a major difference. This is another serious blow to the dog is an omnivore argument. It just does not add up. Side note: I’m adding this here since I know I will forget and I think it is interesting to know this. It is related to the saliva. When dogs lick their skin, nitric oxide is created, which works as an excellent natural antibiotic and prevents infection by inhibiting bacterial growth. Lysozyme (an enzyme) attacks the cell walls of certain bacteria. Histatins a protein and “nerve growth factor” assist with wound healing. So when your dog licks a wound let him unless it becomes an obsessive behavior. Cats do the same. You have probably noticed that cats (also a carnivore) lick their paws first before they groom their faces, head, and ears. That is to transfer these bacteria fighting enzymes to those unreachable areas they cannot directly lick. Moving away from the teeth and jaw we have the digestive system to look at. I’m going to make this as less technical and scientific as I possibly can. To analyze the digestive structure of the dog let’s look at another carnivorous but domesticated animal- the cat. Cats just like all carnivores have a stomach with a high elasticity which is primarily so it can accommodate the huge amount of food they consume after a kill. They never know when their next meal will come so being able to eat more than they need at the moment is crucial for survival. Their caecums (a pouch attached to the appendix) are largely underdeveloped and their stomach not at all as complex in the functionality as we see in omnivores and herbivores. Their foregut and colon which are quite short ensure that passage is quite quick and fluid. For herbivores and omnivores however, their colons and small intestines are way longer and more complex to allow space and time for their plant-based meals to sit and go through the fermentation process necessary for proper digestion to take place. These are two very different systems for digestion and can’t be ignored. In this illustration, notice how short the small intestines are in a carnivore. Dogs have the same sturcture. The internal structure of dogs leans more to the carnivorous side, with their short fore-guts and colons which clearly shows they have no space to accommodate the long and tedious process of plants and vegetable fermentation. This is a good time to remind you that when dogs typically eat unprocessed plants and vegetables, the food comes out almost exactly the same way it went in (no digestion or breaking down occurs). This alone points to the fact that dogs are not designed to eat plants and veggies. In my opinion, your dog gets absolutely nothing from eating plants and vegetables not because they don’t have the nutrients your dog needs but because their digestive system is simply not wired to digest and extract nutrients from plants. I get a lot of flack from this opinion. Since dogs are naturally carnivorous, they are designed to produce enzymes which break down fat (Lipase) and protein (Protease) efficiently. What happens when you give a dog carbohydrates is that rather than digestion starting from the chewing process as is with herbivores and omnivores (they produce the enzyme amylase in their saliva which effectively starts to break down carbohydrates from the mouth), the pancreas is forced to attempt to produce and secrete a large amount of carbohydrate and fiber breaking enzymes to work on the grains and veggies. The problem is your pet lacks this ability. The pancreas of a dog is not designed for the above stated but to produce fat and protein-digesting enzymes, so, when dogs are fed carbohydrates or fibers there is extreme pressure placed on the pancreas to do work it wasn’t naturally designed to do. That, in my opinion, is why we see so many issues with the pancreas in kibble fed dogs the worst one being cancer. Ever wondered why most processed dog foods have unholy amounts of synthetic supplements and vitamins? Maybe you do not know this, but the list of vitamins you see on a bag of “dog mostly synthetic. The process of making this so-called dog food kills all the nutrients and enzymes during multiple heating sessions designed to kill bacteria that may live in the food sources. Killing the bacteria that could harm our pets sound ensuring right? But when you understand that heat kills pretty much everything that could be beneficial too, it becomes far from great. So in order to meet the dog’s nutritional needs and make it so-called ‘balanced’ (something nobody really knows what is), the foods are mixed in with synthetic supplements and vitamins. These unnatural products are in many cases foreign to a carnivore’s digestive system and forces it to make a decision to what to do with these ‘invaders’. One option is to eliminate them, another is to send them into the bloodstream and hope for the best or if in doubt store them for a possible later use. Some of these are stored in the fatty tissue. That’s why we often see these fatty lumps in adult dog’s skin. The body will as a part of their immune functions capsulate these foreign substances. This in most cases starts out as benign lumps but can in some cases turn cancerous. One way to tell is to move the lump with your finger. If it moves with the skin it most likely is a fatty tumor. If it stays it is attached to the body and could be cancerous. All of the above can easily be eliminated by feeding a raw food diet. These points about the teeth and the digestive system should be enough to make you understand why I think dogs are carnivorous in nature, but if that’s not enough, we may have to look at the close relatives of dogs. Taxonomically, the family of the domestic dog is Canidae which is derived from the Latin word for dog (Canis). The entire lineage of the Canidaes is Carnivorous which include but not limited to domestic and wild dogs, jackals, all types of wolves and foxes, coyotes. Since dogs are considered to share so much with wolves and usually used a lot in the study of wolves especially as a physiological model, recent studies into the evolution history of the gray wolf by the Smithsonian Institute have in fact classified the dog as a domesticated wolf so we can compare the eating habits of the wolf with that of the dog to know if they are Omnivores or Carnivores. Their classification is based on scientific facts. You see the enormous importance to them that dogs are omnivores? So important that they have manufactured this lie to keep selling the junk they make. In my opinion, this is the most damaging belief our pets suffer from. This food kills more pets than anything. I’m sorry for my rant and again this is my opinion based on my 18 years of research into thousands of dogs and cats coming from kibble moving to raw. The numbers and data do not lie. There are people who however insist that the dog is not a descendant of the wolf family but that is for them to disprove. However, since we know they are from the same lineage and the wolf is an established carnivore, it is only normal that they share the same dietary needs especially seeing as the dog and wolf already share same physiological needs. 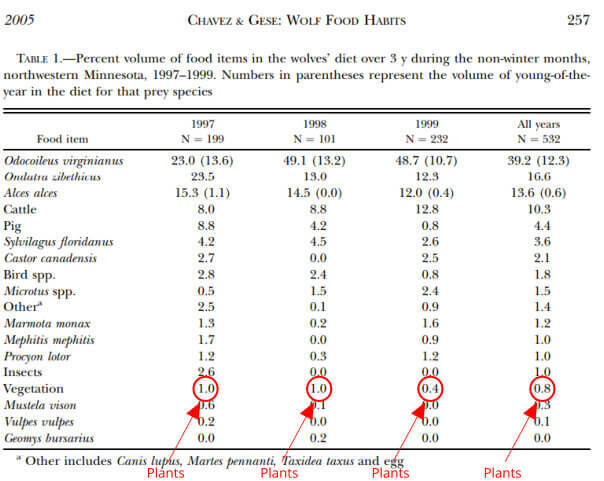 Most experts agree that the eating habits of the wolf clearly points at it being carnivorous. 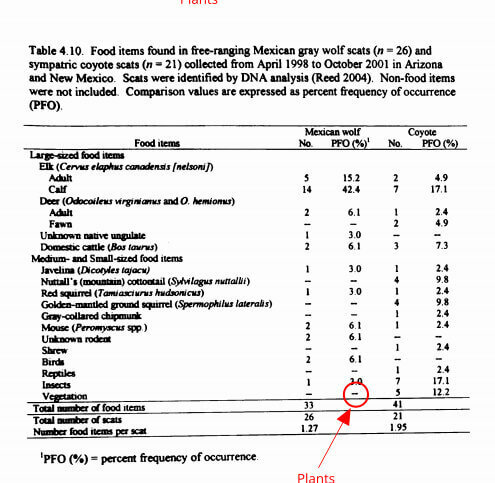 Another argument often used by omnivore advocates is that wolfs eat the stomach contents of their prey. A wolf will only eat the contents of its prey’s stomach if the prey is quite small and has to be eaten fully. For larger preys, the wolf delves into other fleshy animal parts like the heart, liver, intestines, lungs, then shakes out the remnants of fiber food in the stomach before consuming the stomach linings. The diet of a wolf is mainly muscle meat and fats from its hunted down prey. Seeing as dogs share so much with wolfs and are regarded as domesticated wolfs by experts, it is safe to deduce that dogs actually share the same dietary needs as wolves. These dietary needs of the family dogs belong to and their lineage places them as carnivores, not omnivores. Domestic dogs are equally closely related to the African Wild dogs. The African Wild dogs are hypercarnivorous, which means that about 98% of their diet is largely meat. Considering their apparent relationship with either the Wolf or the African Wild dog, you should still come to the conclusion that dogs are actually carnivorous. I actually believe dogs are hypercarnivorous and thrive on this diet. Why do I do that? I have not fed my dogs any veggies and fruits ever. 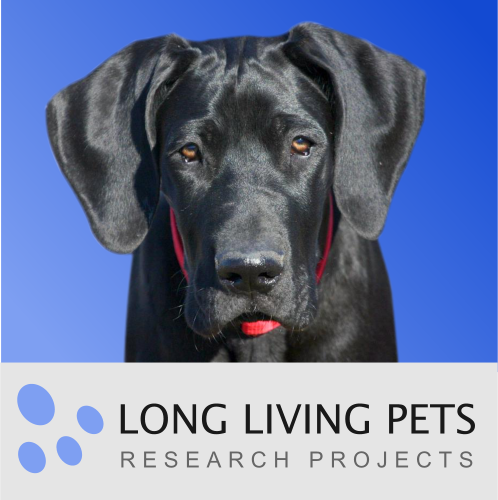 I have not seen any issues, in fact, my 11-year-old Dane has never been to the vet his entire life for any health issues only for blood tests which is part of my research. I recently did a research into wolves to find if there were any documentation of what wolves eat in the wild. I was surprised to find a lot. 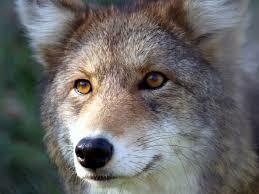 The main reason the studies were done is to determine if wolves prayed on domestic animals in certain areas. I found studies from Europe Mexico and US. One common factor is the amount of plant material found in their droppings. That ranged from 0-7%. The majority was 0-3%. It also varied with the season. Types of fruits like berries were the most common. Therefore I still don’t think dogs need this, but if you do feeding small amounts (less than 5%) of veggies or fruits this will not do any harm. Here are more reasons for my stand on this debate . Some people do argue that dogs have nails and not claws, but this isn’t true. 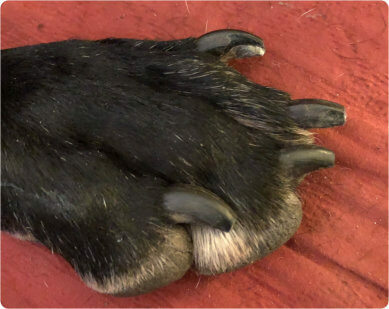 If you’ve ever trimmed your dog’s claws, you’ll notice that they bleed sometimes and this is because claws contain nerves and blood vessels, while nails do not. Nails come to a point and protrude from the ends of the toes. It’s also worthy to note that nails grow from cuticle structures in the skin that support, feed, and promotes nail growth. 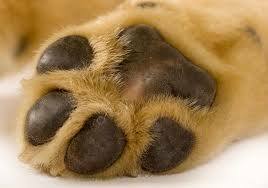 Claws however, come directly out of the phalanx bones at the end of dogs’ toes. The claws help them trap preys, attack enemies, find food and equally dig the ground to hide food for later consumption. It does not help that our vets call claws nails. Next time you schedule a nail trim ask for a claw trim. They will say; “Did you mean a nail trim?” Answer: No it’s not for me, it’s for my dog, which is the one with the claws not nails. I’m kidding, but I have done this. Most preys usually have hooves for feet, it allows them to have a head start when running away from their predators. Predators, on the other hand, have padded feet to allow them to sneak up on their prey undetected. Let us do a quick exercise, in your head, make a list of all the animals you can think of, can you sort them into groups based on their eye positions? If you are able to do this, you’ll find that animals typically considered as preys have their eyes positioned at the sides of their face while those we know as predators have their eyes in front of them. This is definitely no coincidence, so let’s see how this indicates that the dog is indeed a carnivore. Animals with eyes by the side have a wider vision and because they are preys, it helps them quickly detect movement from afar and take flight instantly while animals with eyes facing front are predators and the eyes placed in front of their head give them the depth to see far and sight preys thus giving it time to plan before making the leap. To be fair this alone is not proof of dogs being carnivores since there are omnivores with similar eye position, bears being one. 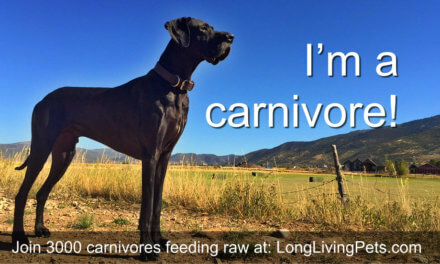 So are dogs Carnivores or Omnivores? Based on the analysis of the teeth, digestive system, family history, and physical structure of the dog, there is only one visible conclusion in my opinion and it is that the dog is a carnivore! I even go to the hypercarnivore classification. I probably lose some of you doing that. I do hope one day to compile enough data to further support this hypothesis. While humans have tried to alter the eating habits of domestic animals, we cannot alter their internal structure in any way. They are definitely designed to be carnivores but their ability to eat almost anything we offer them makes many confused as to what they really are omnivores or carnivores. I can see this and I do not blame the pet owners, I blame the ones that stand to make a lot of money claiming dogs are omnivores. Mother nature has the answers I see and act on. For me, it always comes down to what is nature’s intent for optimal functions. Messing with nature and altering its intent is a dangerous action since one change in most cases has multiple unintended consequences. We all live in a world of synergy and we need to look at everything as a whole, we are in my opinion all connected with nature and disturbing this balance can be quite dangerous and we have little or no understanding of the implications. When this is done mainly due to financial gains we have become the species that is on a path to destroy all species, how sad is that and what an awful legacy? The good part is that we can do something about this. I’m on that mission and I will fight for our pet’s right to the food they benefit from based on what nature designed them as. Summarily, here is a quick rundown of why I say dogs are carnivores not omnivores. Their digestive system is designed to easily break down and absorb protein and animal fat. The eyes of carnivores are usually located in front so they can easily find and pursue prey. Their feet always have claws to help them trap preys, attack and find food. So before you buy that processed food, think of the fact that you might be feeding your beloved pet with something that could prove harmful in the long run! If you do not agree with most of the above. Please do your own research. I just outlined the most telling parts to me that makes me believe dogs are carnivores. I also walk the talk, I have fed a carnivorous diet to my dogs for 20 years now and I the remarkable results from that I can’t ignore. No vet visits for any sort of illness speaks for itself. The fact that my last Dane was 13 years old and my current oldest Dane is 11 and still keeps up with my 6-year-old Dane speaks volumes. So for anyone to tell me a dog is not carnivore but an omnivore and needs veggies and fruits plus more don’t stick with me. The true fact is that I have never fed my dogs any veggies and fruits ever! Do Wolves eat veggies and fruits? This is a debate that has bee going on for as long as I remember. I’m not getting into a big debate about this. I did some research and this is what I found. This is from a study in Belarus. This is from a study in Arizona and New Mexico. 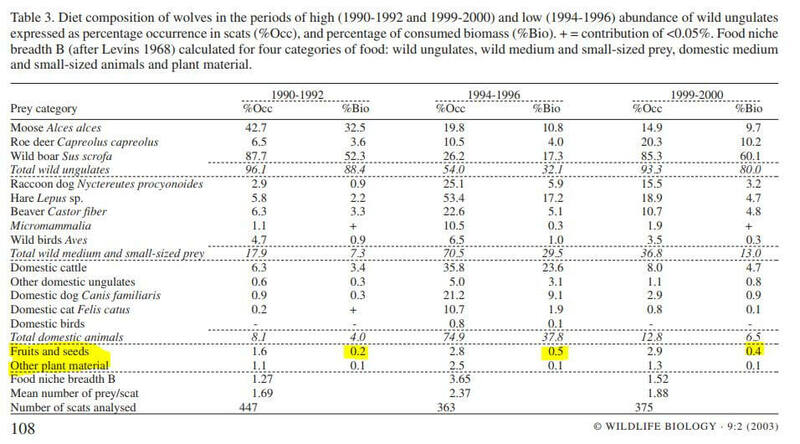 The highest amount of plant materials detected was 1.3 %. 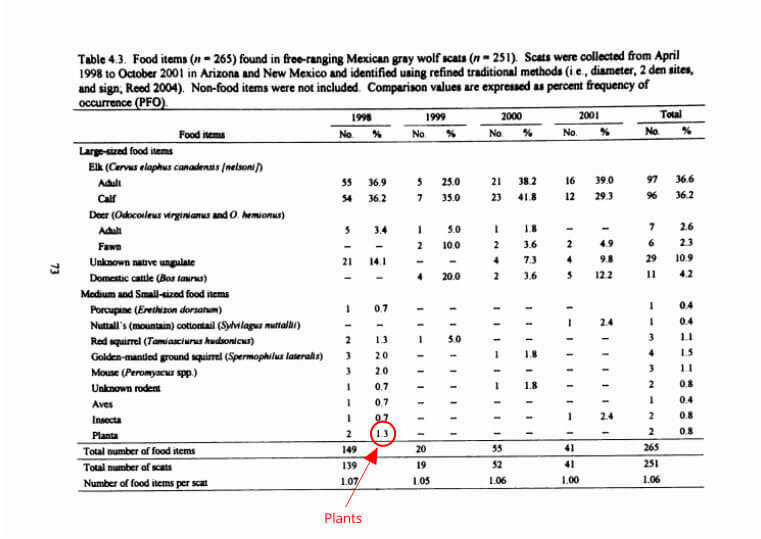 This is from a study in Arizona and New Mexico of free-ranging Grey Wolf scats. In this study, no vegetation was detected. This is from a study in Minnesota from 1997-1999. This one I find interesting. It was done in the non-winter month so a supply of plant and berries should be available. The highest number is 1% plant materials detected. This study is also from the Summer months (May-September) and the winter months (October-April). This study analyzed berries as a food type. They found 3% in the summer months and 1% in the winter months. 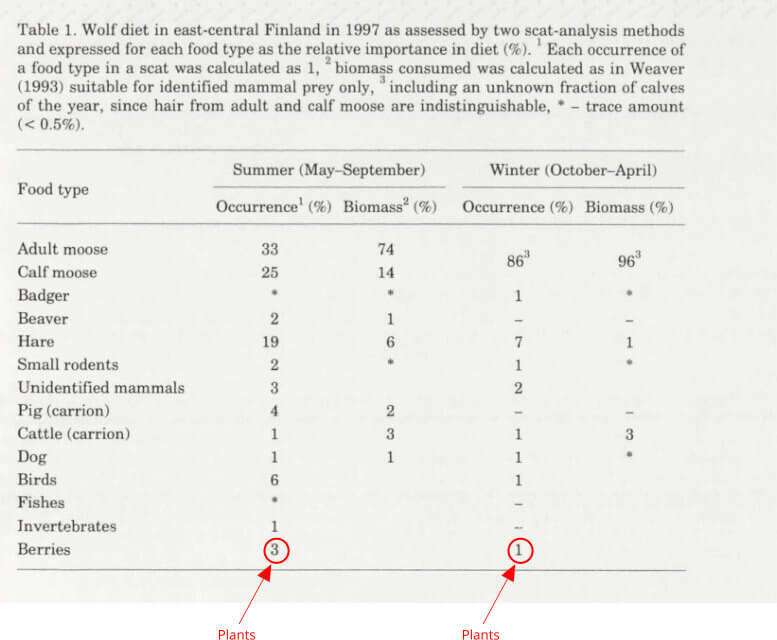 This is again extremely low and confirms that berries are not a vital part of a carnivore’s diet. My Great Dane Odin a carnivore.